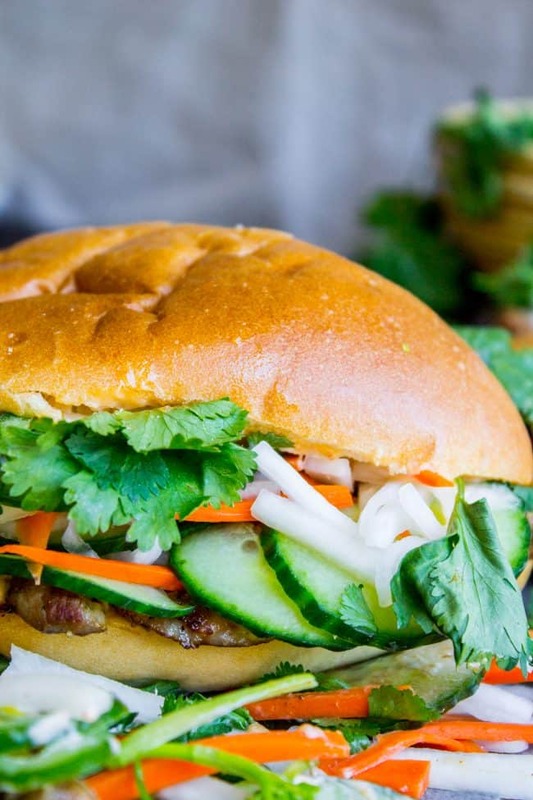 This traditional Vietnamese Banh Mi Sandwich will blow your mind! A mini soft baguette, smeared with sriracha mayo, topped with thinly sliced marinated pork, pickled veggies, and tons of cilantro. It’s heaven! This morning I went to Safeway at 6:45am. Never in my life have I set foot in a grocery store so early, but it was kind of nice! No crowds, and employees everywhere asking me if they could help me find anything. YES! please help me, where is the daikon because I’m making BANH MIIIII!! But back to the Banh Mi’s. Have you heard of them? Have you had one? The time is now! Just look at this! Start with a soft (not crunchy!) mini baguette. Hero/hoagie rolls will work but it’s even better if you can find Bolilo rolls. They are Mexican rolls used to make tortas, and I found them in the bakery section at Safeway. Whatever roll you use, make sure it’s not so crunchy that it will scrape the roof of your mouth, who wants that? Then you slather both sides of the roll with copious amounts of Sriracha mayo (copious I say!) 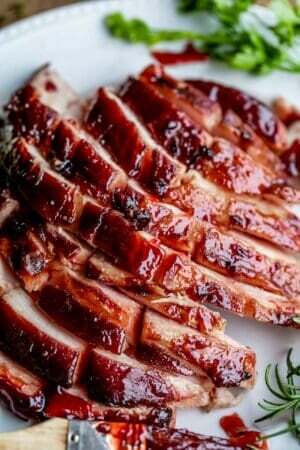 and top with super thin-cut pork that is perfectly seared and oh-so-tender. Then come the veggies: pile it high with cucumbers, jalapeños, quick-pickled daikon and carrot, and mile high cilantro. In my opinion, Banh Mi sandwiches are just an excuse to eat fistfuls of cilantro. Could there be anything better?? I know all the cilantro haters out there are gagging right now. But wait come baaack! You can replace the cilantro with another herb if you want! I think it would be good with basil (ooh! Thai basil if you can find it!) or even mint. Or maybe dill?? 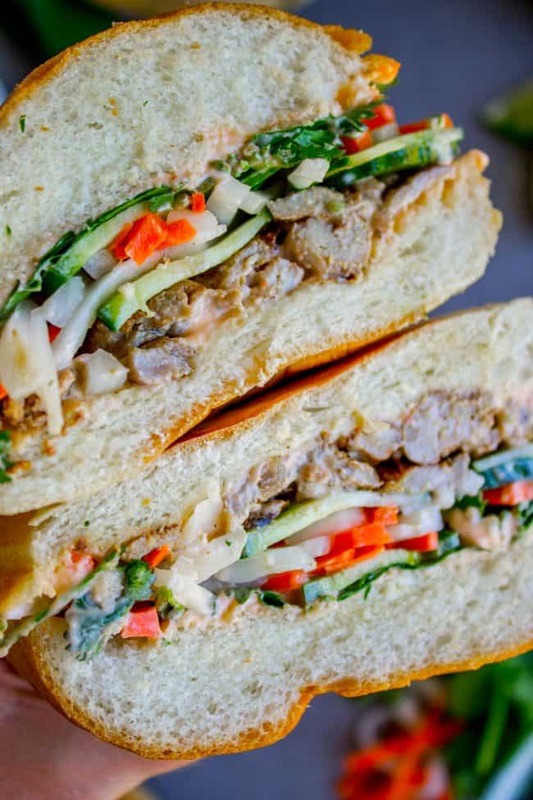 Another key element to a perfect banh mi sandwich is the pickled daikon and carrots. Daikon is a kind of radish commonly used in Asian cuisine, and if you can’t find any, just swap them out for radishes (radishes are stronger so maybe don’t use as much). The pickling process only takes about an hour. They last for months in the fridge, so if you have any leftover (I always make extra!) then you will have a ready to go sandwich topping in your fridge! Or burger topping! Or pulled pork topping! I’m telling you it’s so good! There should be a 2:1 ratio of veggies to meat on a traditional Banh Mi sandwich, but if you cheat and add more pork I won’t tell anyone. Besides the cilantro and pickles, the thinly sliced and marinated pork is what MAKES this sandwich. It is so tender and flavorful. To achieve this, you have to start out with a great pork tenderloin. I’m super pumped to be writing this post in partnership with Safeway to tell you all about their Open Nature brand! 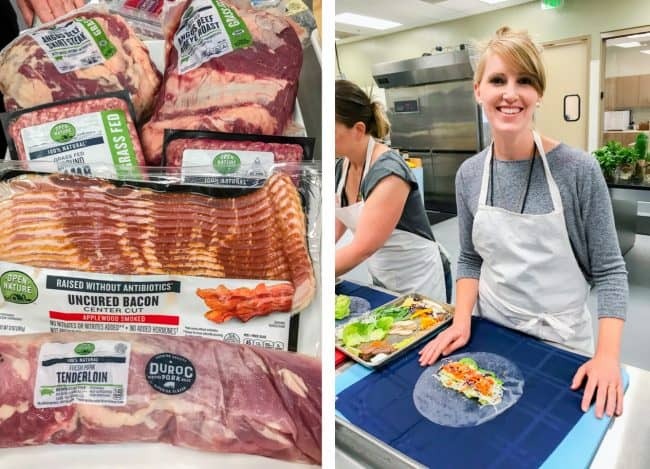 A few weeks ago they brought me to the Safeway Culinary Kitchens and Technical Center in the bay area for a day of food and fun. We got to learn all about Open Nature products, which you can only buy in their stores. I’m in love!! Their pork is vegetarian fed and never treated with antibiotics. It is truly the highest quality. They have hundreds of products under the Open Nature brand (think yogurt, hand soap, ice cream, salad dressing, household cleaners, etc. ), but I particularly love their meat products. They taste amazing! I asked the butcher behind the counter at Safeway if she would slice the Open Nature pork tenderloin for me. SOOO much easier than doing it at home. Grab a pork tenderloin from the shelf and ask the butcher to do the hard work for you! It will be hard to get it this thin at home. On the right are all the ingredients you need for the marinade. I just tossed it all in the blender because I’m lazy! Here are the carrots and daikon after 15 minutes of sitting in a bit of salt and sugar. It makes them flexible. They will still be crunchy, but will be able to bend without snapping. I made these Banh Mi’s several hours ago now and am learning just how much I rub my eyes. Because after slicing those jalapenos my eyes are burning! Gah! Be careful! Or buy latex gloves for the kitchen. Why do I not do this?? 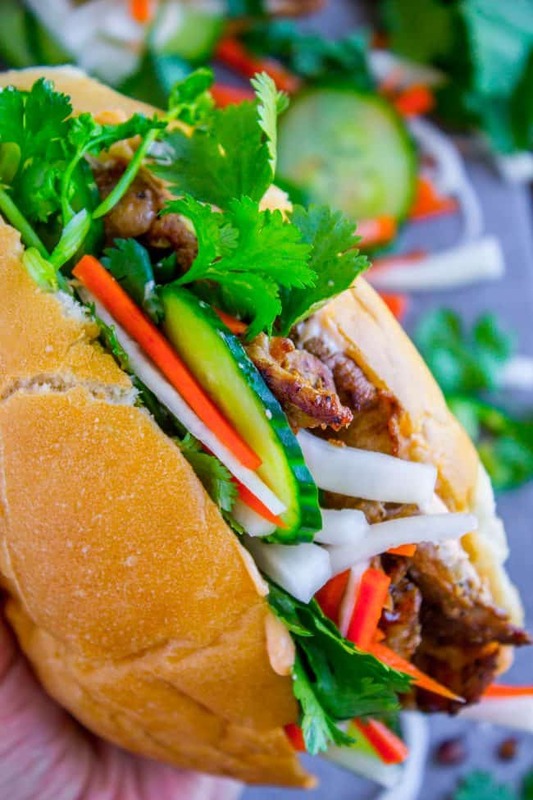 These traditional Vietnamese Banh Mi Sandwiches will blow your mind! A mini soft baguette, smeared with sriracha mayo, topped with thinly sliced marinated pork, pickled veggies, and tons of cilantro. It's heaven! Begin by slicing the pork tenderloin very thin. Or better yet, ask your butcher to do this for you! 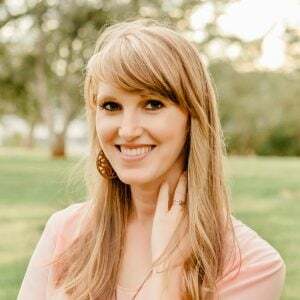 They can do it in about 2 minutes and it will save you tons of time. And they will get it much thinner than you can get it at home. In a blender or food processor, add the shallot, garlic, sugar, honey, fish sauce, sesame oil, salt and pepper. Pulse until combined. It's okay if there are chunks of onion or garlic. You can also just chop the shallot and garlic by hand and mix it all together in a bowl, I'm just lazy. 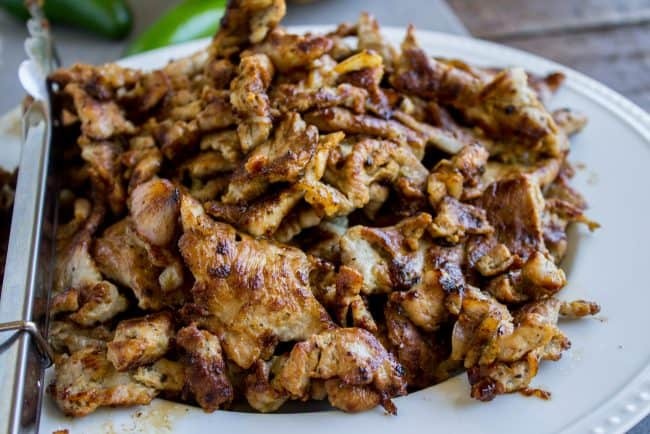 Add the marinade and thinly sliced pork to a medium bowl, cover, and refrigerate for at least an hour, or up to 24 hours. Make the picked veggies: Chop the carrots and daikon into matchsticks. See photos. You want them to be about the length of a matchstick and the thickness of your average chop stick. It doesn't have to be perfect! Don't stress about it. Just chop them up thin-ish and your sandwich is going to taste amazing. Add the chopped veggies to a large bowl and sprinkle with 1 and 1/2 tablespoons salt and 1 and 1/2 tablespoons sugar. Use your hands to massage the sugar and salt into the veggies. We're doing this to get the carrots and daikon to release water, so that they will be flexible but still crunchy. After 15 minutes of sitting in the salt and sugar, you should be able to bend a carrot without it snapping (see photo). Pour the veggies into a colander and rinse them under water until all the salt and sugar is washed off. Rinse out the bowl and make the brine: combine 1/2 sugar and 1 cup warm water, and stir to dissolve. Add the vinegar and a few shakes of salt. Stir it all together. When the pork has marinated, heat a large skillet over medium high heat. Add about a tablespoon of oil to the pan. Make sure it is shimmering. Add the pork strips in batches. If you add it all at once, it will not brown. Make sure there is about an inch of space in between each piece of pork. Sear the pork for about 1-2 minutes, then flip and sear for another minute or so. If you sliced the pork yourself, you will probably have to cook it longer because it will be thicker. Adjust the heat as necessary, you want to keep it as high as possible without the pan scorching. Continue searing until all the pork is cooked. Add more oil as necessary. Set aside on a plate, or put it in the oven on a pan on the "keep warm" setting (170 degrees F). In a small bowl, combine 1 cup mayonnaise and 1 tablespoon Sriracha (more or less Sriracha to taste). To assemble: Slice a roll in half lengthwise. Spread both sides with Sriracha mayo. Top with the other half of the roll and eat! 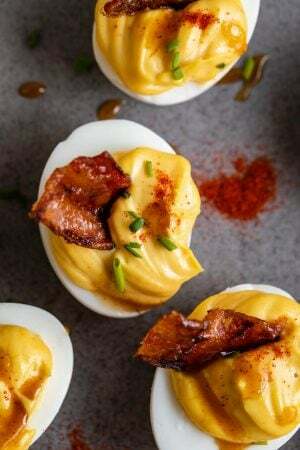 Serve with more Sriracha mayo if you want. More Asian dishes you will love! 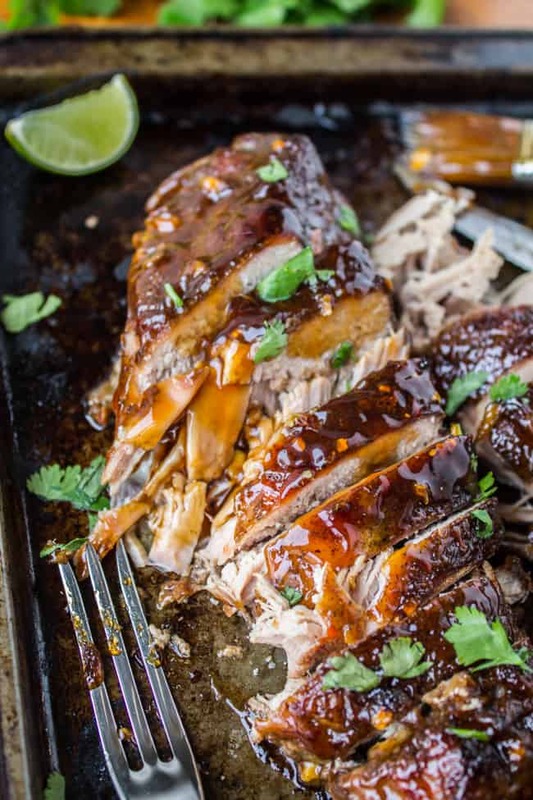 Asian Pork Tenderloin with Ginger Glaze (Slow Cooker) << this pork would also be delicious on a Banh Mi Sandwich! 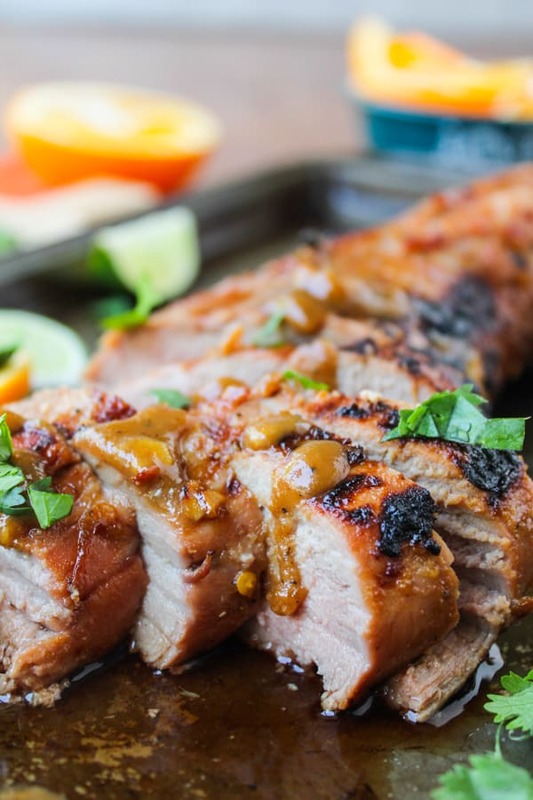 Grilled Pork Tenderloin with Peanut Lime Sauce << this is soo good. 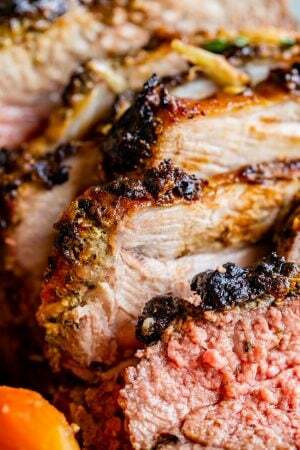 Grilled pork tenderloin is amazing. 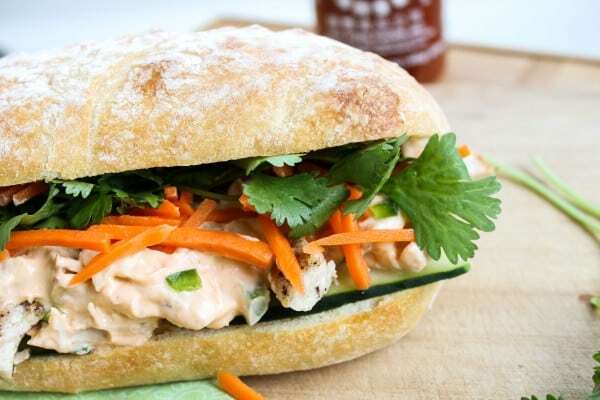 Leftover Turkey Banh Mi <<this is a much more simplified version of today’s recipe. Use any protein you like! 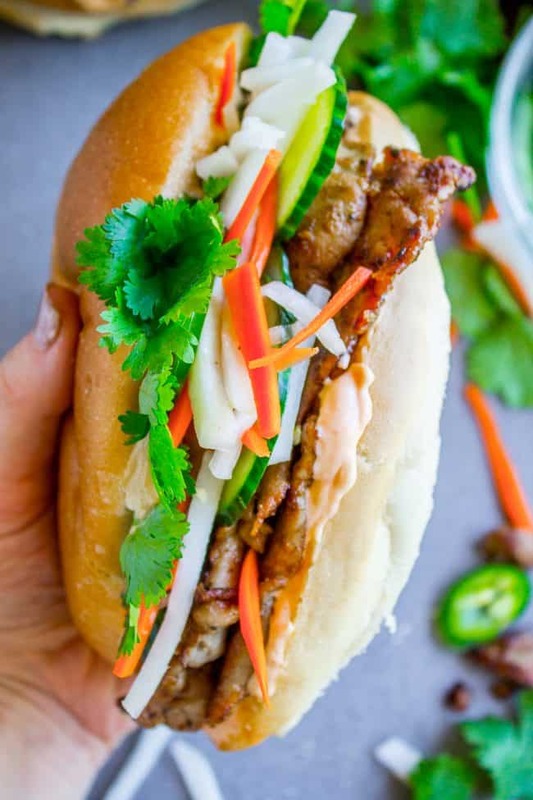 Other fun Banh Mi Sandwich ideas! Cheesy Shrimp and Grits Banh Mi in a Waffle Cone from FoodieCrush << whaaat!! This post is sponsored by Safeway. All opinions are my own of course! Thanks for supporting the brands that keep The Food Charlatan running! Yes I’m so glad you made this Kim! 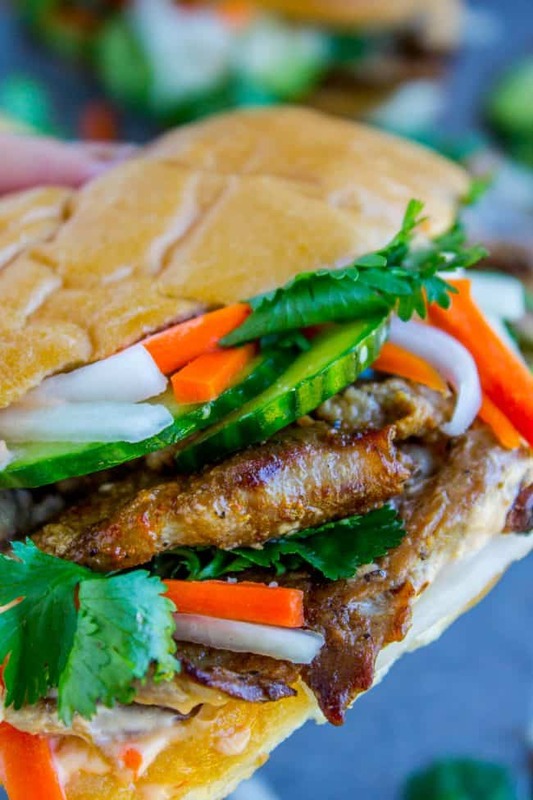 Now I am craving a huge Banh mi sandwich. Good idea using chicken, I’ll try that sometime! And so glad you loved the biryani. Thanks for reviewing!! 6:45 am? Yikes. I would have probably left more than my phone there lol. This sandwich looks so amazing. I’m sitting at my desk here at work (it’s 9:20 am right now) and I really want to eat it. Love Vietnamese food mmmmmm. This looks delicious Karen. My mouth is watering! One question: how thin to ask the butcher to slice it? What’s the optimum thickness? I bet if the pork loin is partly frozen you can get the slices pretty thin at home. I always freeze my meat for stir-fry for a bit so it’s easier to slice so I bet that would work for this. As thin as they can get it basically. Between 1/8 inch and 1/4 inch would be ideal. I have a picture up there that shows how thin mine was sliced. That’s good tip to put it in the freezer!! You have to make this Kris, I know how much you love cilantro!! 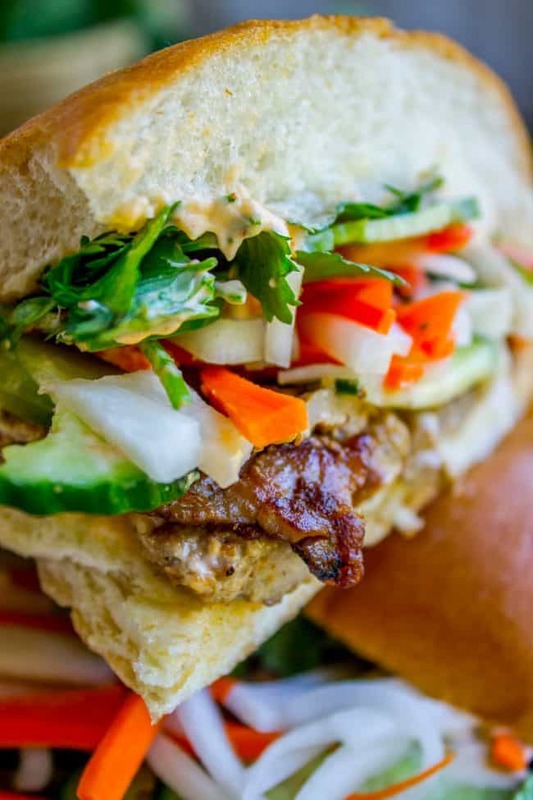 Those of us that are lucky enough to live in the Bay Area have so many places we can order and eat these wonderful Vietnamese sandwiches but now I don’t need to drive to one of those places! 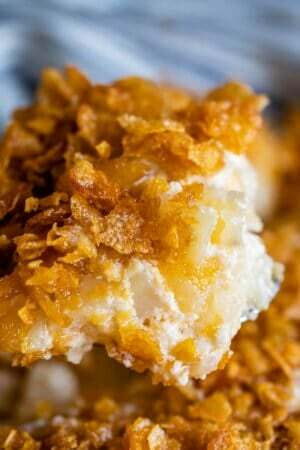 Thank you so much for posting this recipe and I’ve put the ingredients on my grocery list. Yes we are so spoiled living near the bay!! So many amazing food options. I hope you love this home version just as much Laurie!! Thanks for commenting! This sounds great but I am not a fan of traditional radishes at all. I do, however, love pickled vegetables (vinegar is my favorite condiment). Is there a chance I will like daikon? I’m one of those “cilantro tastes like soap” people so I am thinking I will use a combo of basil and dill in its place. Hey Fran! I think daikon will be a great option for you. It is pretty mild. If I were you I would buy a small daikon and extra carrots just in case. If you don’t love it, at least you will have the carrots which you are sure to love and will still make a delicious sandwich! I think basil and dill would be a great sub for the cilantro!! This also one of my favorite sandwiches! Love the crunch and color the veggies give it! 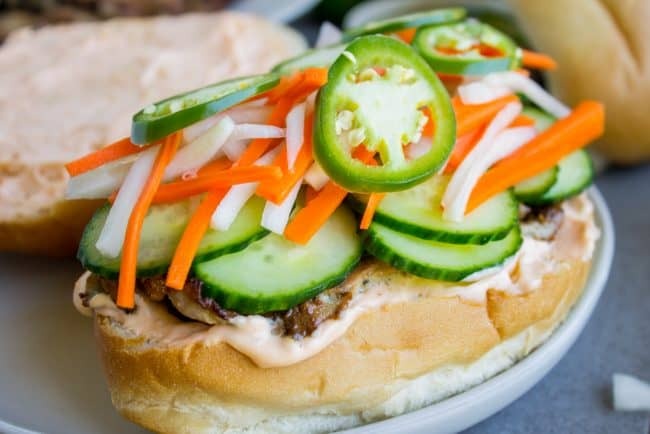 I pinned a recipe that combined a philly cheese steak with a banh mi, I’m gonna try too. Yum now I’m craving this! Philly Cheesesteak Banh Mi!!!! omg!!!! Going to go find that recipe that sounds amazing!!! Hope you get to eat some version of Banh mi soon Angie, thanks for commenting!